When dry wood makes contact with moisture or condensation in unventilated areas, there is a good chance that wood decay will occur. Common sources include faulty plumbing, leaky downspouts and rain leaks. The decomposition of wood is not a sudden occurrence; rather, the damage is gradual and remains inconspicuous until the final stages. Your first reaction might be to replace the wood. But, have you considered restoring the wood instead? Replacing wood can be an expensive and time consuming project. Depending on how far the fungus has spread, it could be impossible to replace the wood. One of the effects of wood decay is the growth of fungus, which spread quickly and destroys the wood. Cutting out rotted areas is one possibility. However, this process might not remove all of the infected areas. Unless the fungus is removed completely, the rotting will continue until floor break or doors fall. 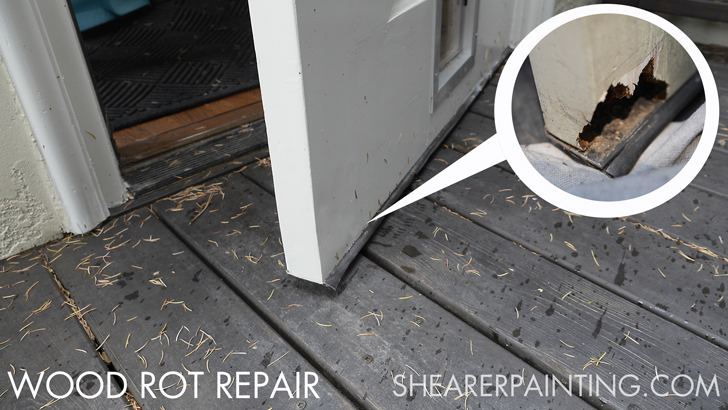 There is a do-it-yourself alternative to replacing wood: repairing damaged areas with epoxy. Most repairs can be completed in a few hours and can be simple to follow once you learn the process. Based on the extent of repairs needed, the tools you need include a drill, hammer, chisel, putty knife, chemical-resistant gloves, wood files and rasps. In addition to epoxy that is available at the local home improvement store, you will also need 80 and 120 grits sandpaper, wood consolidant and a small squeeze bottle. Generally, this step-by-step process works best for cosmetic repairs. 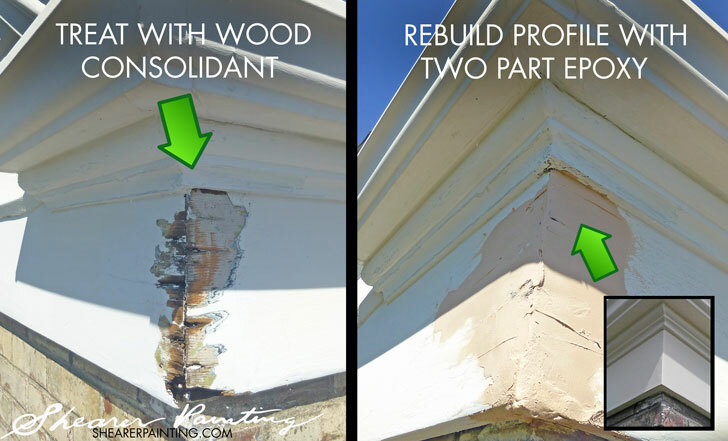 If there are structural concerns with a rotted wood area, a special type of epoxy is required. The first thing you want to do is investigate the area where the rot is occurring. Probe the surrounding area where the wood is damaged with a screwdriver. If the wood is soft and easily penetrated, it is rotten and should be reinforced with epoxy. Once you have located the cause, begin removing the rotted wood. Strip off old paint with caution since it could contain lead. Use a lead-safe paint removal technique. Using a chisel or screwdriver, gouge out the rotted wood. Next, use the drill to make several 1/4” holes around the area to be repaired. The holes are necessary so that moisture can escape and have a reservoir for the epoxy consolidant that is applied later to soak into water-damaged areas. Separate approximately one-inch apart and drill without going through the wood. If you make a mistake and drill through the wood, use painter’s putty or oil clay to plug the hole. Follow the manufacturer’s instructions for mixing the epoxy consolidant. Squeeze the mixture into each hole and onto the wood surface. Use a small disposable brush to begin working the consolidant into the wood. Continue until the wood is completely saturated. Cover the area with a loose-fitting plastic tent to protect it from outside elements. Drying usually takes about one week, but dries quicker on dry, sunny days. However, you do not have to wait one week before you can begin using the epoxy filler. You can mix the filler and work in the first layer with a putty knife, which is discussed more in step two. Now, you are ready to mix the epoxy, fill the wood cavity and shape the wood area. Take a golf ball sized portion of the epoxy wood filler parts A and B, and mix both with a putty knife. The mixture should be blended after two or three minutes. Using the putty knife, fill the wood cavity with the epoxy filler. Press the epoxy hard in the areas to get a secure bond and to make sure all voids are filled. Heat accelerates the hardening process of the epoxy; you have a 30 minute window in a 70 degree environment. Work in a shaded area to mix and apply the epoxy since coolness slows down the hardening process. A spotlight or hair dryer works well to speed up the hardening if necessary. TIP: Make sure you label lids and mixing sticks to keep unwanted materials separate. For instance, if you put the lid from part A onto part B’s container, it will become glued. Always start with mixing boards and clean containers to avoid unwanted reactions. Contaminating new epoxy with an old mixture will decrease your working time. Make sure you have on chemical-resistant rubber gloves to protect your hands. Overfill the wood area with the epoxy mixture and shape it using your fingers. Overfilling will ensure that there is enough to shape. Use a scrap piece of wood to pat the epoxy as it is being shaped. Do not worry about making a perfect shape and add more filler if necessary. If the weather is warm, the epoxy will firm up in approximately three to four hours. The area might need to harden overnight in cooler weather. Work in a well-ventilated area when using epoxy solvents. The final step in repairing the wood area with epoxy is smoothing. You are ready to smooth out the area in a more defined shape and add a finishing touch. Test the epoxy with your fingernail. If you cannot make a dent, it is hard enough to file. Hardened epoxy is pliable for shaping and sanding with regular woodworking tools. Rough out the contour with a plane or coarse rasp. This removes large quantities of material before you begin refining the shape. If you accidentally remove too much at once, you can add an extra layer of epoxy and repeat step two. Use the surrounding wood shape as a guide. Begin working on the details once the shape emerges. Generally, you may need half-round, round or flat wood files based on the shape you want to recreate. Fine tune the area and smooth the epoxy with sandpaper once the shape you have the exact shape. Protect yourself with eye gear and a dust mask while sanding. Afterward, vacuum excess dust from the area and brush a primer over the epoxy. Spread primer the surrounding area of bare wood. Seal joints with polyurethane caulk in between separate parts before the final coat is applied. Usually, you will need two coats of top-quality acrylic paint to finish the repair. Inspect the area periodically and add more caulk or paint as necessary. 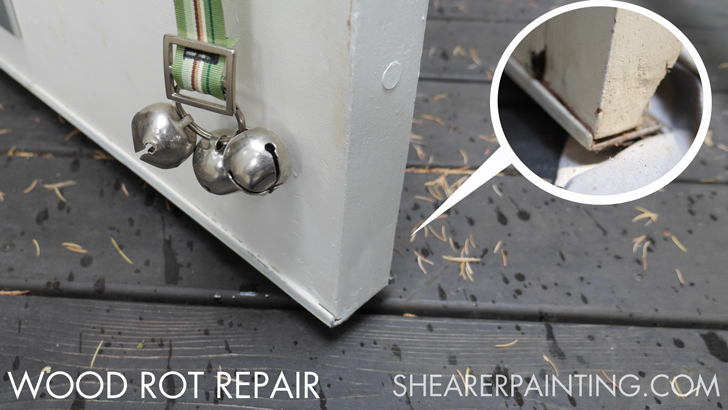 With a good paint job, your wood epoxy repair might outlast surrounding wood that was not treated.